Now that you have purchased your petrol hedge trimmer, a question that many gardeners ask is how often to trim different types of hedge. Maintenance trimming for informal, more naturalistic hedging might only need to be done once a year, formal hedges will need trimming two or three times a year. Coniferous ones should not be cut after late August in the UK to avoid the risk of bare patches. In the case of berry-bearing shrubs, delay cutting until after the berries have disappeared as they provide valuable winter food for birds. In the case of flowering hedges, check the instructions for that particular species. This type is usually only cut once a year and trimming at the right time of year will promote flowering the following year, but if you get it wrong, you could cut off the growth on which the flower buds will develop for the following year – a disaster! 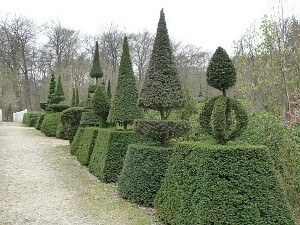 Even large, vigorous hedges do not need to be more than 2 ft or 60 cm in width if they are regularly trimmed. Keeping them to a manageable height will avoid you (or your neighbours) having unwanted shaded areas in your garden. A large hedge should be ‘cut to a batter’. This means that the base should be left slightly wider than the top to achieve a tapering effect. Whilst you want your young hedge to grow to the required height as quickly as possible, do not give in to the temptation of letting it romp away! If you do, you will end up with straggly hedging with no ‘bottom’, that is open at the base with widely spaced branches and not a proper hedge at all! You need to cut it back by about a third when you first plant it. Do the same again the next year. After this, you do not need to be so severe, you can cut back by a smaller amount each year until you have a beautiful, well cared-for screen that is thick right down to the base, has grown to the required height and width. Use your petrol hedge trimmer with the blade parallel to the hedge. Always work from the bottom upwards and use a wide, sweeping action so that the material you have cut falls away from under the blade and does not cause clogs or snarl-ups. This entry was posted in Advice and tagged flowering hedges, formal hedges, hedge trimmer, petrol hedge trimmer, vigorous hedges. Bookmark the permalink.